- Cinema San Pedro (San Jose, CA) will screen Supercop on Wednesday, August 11, 8:00 p.m..
- Added in Links: a review of Silver Hawk and a message board on Michelle in simplified Chinese. - According to this James Bond website, Wai Lin will be the first new 12-inch figure released as part of Sideshow Collectibles continuing James Bond line for 2005. Photos of the Wai Lin figure can be expected to be revealed next month. The figure will be released in February and will retail for $39.99. - At this year's FILMART (Hong Kong International Film & TV Market, June 23 - 25), Michelle, together with Jackie Chan, Andy Lau, Chow Yun-Fat, Maggie Cheung, Sammi Cheng, Carina Lau, etc., are voted by buyers as the top ten "Most Desirable Hong Kong Actors and Actresses". All greetings will be forwarded to Michelle on her birthday. Use English only, please. 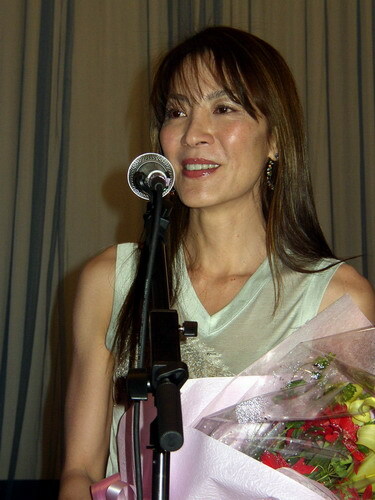 If you signed on Michelle Yeoh Web Theatre Announcement List before June, or if you are on the mailing lists of Kityi (of YeohFanz) or Dean (of Michelle Yeoh Collective), you may have already known that we have another small project planned for Michelle's special day. I won't say more details here since we would like to keep it as a little surprise for Michelle. If you haven't heard of it and would like to find it out/join us, you may e-mail any of us. Thank you everyone. - Butterfly & Sword: new audio clip of the Mandarin version of the end song, Love Is Like a Shooting Star, by Michelle. Available in MP3, Real Media, and Windows Media formats. - Hua Mulan update: the production is to start this winter. "I'm so happy to meet with so many good friends tonight. Thank you all!" Michelle smiled. When asked what's the next film she's making, Michelle said: "They are all under preparation. I will announce it as soon as one is ready." - Michelle showed up at June 6th's screening (premiere) of Tomorrow Never Dies at the SIFF. She accepted flowers and answered one question from audience ("How did you feel when you were kissing with Bond?"). Later she appeared at Shanghai TV station to record a special interview for the "OK Xin Tian Di" program. - June 5th, Shanghai. Michelle attended the opening ceremony of the Shanghai International Film Festival (SIFF). 578 films from 51 countries/regions were submitted to the festival. 167 will be shown, including 16 of them in competition. Other Hong Kong stars/filmmakers who walked through the 200 meter red carpet include Carina Lau, Sammi Cheng, Tony Leung Ka Fai, Rosamund Kwan, Eric Tsang, Stanley Tong, Sammo Hung, and Stanley Kwan. Michelle rushed to the opening of Ferrari's showroom (the first one in China) afterwords. 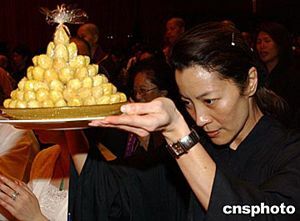 Brothers & Taihe Film Investment Co.
- News photos: Michelle at the closing ceremony of the display of the Buddhist sarira at Hong Kong Convention and Exhibition Center. The Buddha's sarira (finger-bone relic), together with 20 other national treasures, had been in Hong Kong on loan from Xi'an Famen Temple for a 10 day exhibition since May 26. - Tomorrow Never Dies will be shown at the 7th Shanghai International Film Festival. Sunday June 6, 1:30pm, Shanghai Film Art Center, Hall 1. Michelle is going to be at the screening. The film was originally banned in mainland China. It was never released in cinema there (although DVD/VCD are very easy to get). - Michelle attended the fund raising and 10th anniversary celebration banquet of HKPAG (Hong Kong Performing Artistes Guild) at the Inter-continental HK, May 28th. About 600 celebrities attended the party, including Jackie Chan, Eric Tsang, Jacky Cheung, Tony Leung Ka Fai, Stanley Tong, and local tycoon, Macau casino magnate Stanley Ho. The party started with Michelle and Dr. Stanley Ho's 7 minute cha cha dance performance, which was described by media as "the most brilliant performance of the night". Formed in 1993, HKPAG is the non-profit organization representing Hong Kong's film and television actors, actresses, singers, stage performers and dubbing artistes. 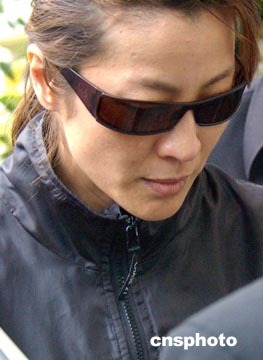 Anita Mui was one of the founders and the president for the past two years. - Butterfly & Sword: added a new song page, "There is a dream in my heart". It is the Cantonese version of the end title song - yes, it's performed by Michelle herself. It has the same melody as the Mandarin version but the lyrics is different. The Cantonese version of the song seems never to have appeared on any video of the film. All the DVDs, VCDs and video tapes I have seen have the Mandarin version of the song only, even with the Cantonese sound track. I wonder if this Cantonese version of the song was shown with the original Cantonese version of the film (can anyone from HK fill me in?). 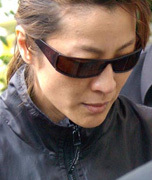 - The Heroic Trio: new audio clips of the two Anita Mui's songs. They are recorded from a music CD of Anita's and have much better quality than the previous ones which were recorded from a movie VCD. Cantonese phonetic translations are also added - see the lower part of the song pages. - Chinese newspapers reported that Anna Leung, Michelle's assistant, said Michelle is going to attend the opening ceremony of the 7th Shanghai International Film Festival (June 5 - 13). Besides the preparation of Hua Mulan, Michelle also has several other projects in talks. There is a hope that Michelle may work with Chinese director Feng Xiaogang (Big Shot's Funeral, A Sign). - In The Heroic Trio: all the images are new. I've been wishing that I could find more time to re-scan all those movies that the older images were captured from low resolution VCDs. So far new scanning has been done for The Heroic Trio, The Soong Sisters, Butterfly & Sword, Tai Chi Master, Wing Chun, and Police Story III: Supercop (see Movie Index). - Trailers & Clips: added Silver Hawk trailers and updated some links. - Congratulations to Maggie Cheung for winning the best actress (Clean) at Cannes - the first Chinese actress who received this honor. - Reportedly, Michelle, as well as Maggie Cheung, was invited last month to the U.S. to audition for the film Memoirs of a Geisha. Based on a 1997 best-selling novel of the same title by Arthur Golden, it is the story of a Japanese geisha around World War II. The production has been under development for years. Rob Marshall (Chicago) is currently attached as the director, with Steven Spielberg as a producer. The filming is said to start later this year for a 2005 release. - Silver Hawk will be screened by Arclight at Cannes market. Monday May 17th, BORY K, 14:00. - Michelle arrived at Taipei, Taiwan on May 7th. She was invited as an ambassador for a Regent Galleria jewelry show. At the press conference, Michelle was asked what's the most meaningful jewelry she's ever had, she answered it's a pair of diamond earrings her parents gave to her for her college graduation. When asked that if her boyfriend gave her a diamond how big she would like it to be, she half joked "the bigger the better". Then she said seriously: "A true heart is more valuable than a true diamond." Asked about her future film plans, Michelle said she had four films in plan. She just returned from U.S. where she had been discussing a film deal. She didn't want to disclose any detail since no contract has been signed yet. Michelle is also planning to make a film with director Ann Hui (Ah Kam). Hua Mulan is not expected to start until next year. Michelle may go for a trip to London soon, possibly stop at Cannes. "The Avenue of Stars honours famous celebrities from the silver screen, and those behind the camera who make the magic happen. - Have a long history of service within the industry. Members of HKFAA's 10 film-related organisations voted by secret ballot to decide who was to receive this honour." Photo from "Xin Hua": Tourists looking at Michelle's handprints at the Avenue of Stars that opened to public since April 27. - Photos: Michelle at the opening ceremony of an Armani flagship store at Shanghai, April 17th. The Italian designer, Giorgio Armani (who is a friend of Michelle's), plans to open as many as 30 stores on the Chinese mainland by 2008, the year of the Beijing Olympics. - I have got a copy of the official DVD of Silver Hawk from Five Star Laser. It's NOT region coded although on the back cover it's marked as Region 3. "Making of..." is really cool but it doesn't have English subtitles. It's funny how the Panda was wrestling with Michelle. Ouch - that bad kick on the head! - Michelle was at the celebration party of Louis Vuitton (LV), in Hong Kong April 16. LV selected Hong Kong as one of the four cities worldwide to host its 150th anniversary celebration. The other three cities are Paris, New York and Tokyo. More than 2500 guests attended the biggest party of the year in Hong Kong. - In Silver Hawk: DVD information and cover pics. - More updates on CTHD Novels & Prequel: information on the comic books and the cover pics for the latest two books (Vol.5 and 6). - Crouching Tiger, Hidden Dragon prequel: news from Taiwan says that the script is finished and the production can be expected to start in summer 2005. For more details see CTHD Novels & Prequel page. - According to DDDHouse, Hong Kong Silver Hawk DVD/VCD will be released by Mega Star on April 16th. It has both English and Chinese subtitles. - Michelle, who just returned to Hong Kong from Malaysia, attended the premiere of Stephen Fung's directorial debut, Enter the Phoenix. Michelle said Stephen Fung is a new generation director and should be supported. She also said if Stephen Fung needed help in his future films she would be glad to provide. 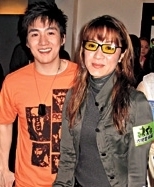 Photo from "Takung": Michelle and Brandon Chang at the premiere. - I have not seen it myself, but heard that the latest issue of "Film Review" magazine (UK) has Michelle featured as No.6 at the Top 25 Iron Maidens. - Thanks Frida for the CNN's TALK ASIA interview! We did not succeed in reducing the size or transfer it into different format (thanks BAM for trying! ), sorry. This is the first third of the interview and it's about 30 MB. If you would like to download it, you are strongly encouraged to use Download Accelerator. - Subway Cinema (New York) will present Royal Warriors on April 25th at the Incredible Subway Sundays. - Not new, here is a link to a report and some photos from January. 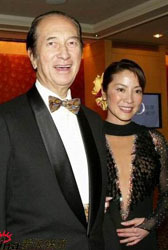 Omega Press Events: Omega opened its first flagship store in Beijing in presence of Silver Hawk - Michelle Yeoh and Richie Jen (January 13 2004). - New in Silver Hawk: photo collection from the Asian premiere tour, January 13th - 27th. Silver Hawk is releasing in Taiwan this week. - New in Gallery -> Magazines: added eight magazines. THANK YOU, Johnny K., for the beautiful photo scans! Note that some of the articles are incomplete or missing. If any of you happens to have access to those articles and could share with us, please e-mail me. Thanks in advance! - Talk Asia will also be aired in U.S. and other countries. Check CNN International for schedule at your region (use the pull-down menu "More show time info" at left side). The show is 30 minutes. - "What makes me happy is knowing that my family is well, and I?m healthy," Asian Action Star Michelle Yeoh Interviewed on CNN's TALK ASIA. It will be first aired on Feb. 28 in Hong Kong, Kuala Lumpur, Manila, Singapore and Taipei. See the above link for airtimes. Photo at right: Michelle with CNN's TALK ASIA host Lorraine Hahn (from UDN). - Variety article on Silver Hawk. According to the article, the film will open in Korea in March, Japan in April and Europe this summer. A North American distribution deal is in the works. - If you would like to get a free pass for AFM premiere screenings (including two screenings of Silver Hawk this week), you can register at AFM official site. - Silver Hawk will be released in Taiwan on March 19th. - Here you can download video clips from MTV Asia Awards and Malaysia Silver Hawk Premiere. Millions of thanks, Frida! - Premiere tour videos are up at the Silver Hawk Official Site (Breaking News). Direct download links can be found at Silver Hawk -> Video. - Michelle was honored with The Asian Film Award for her contributions to the Asian film industry on the 2004 MTV Asia Awards. It was the third annual MTV Asia Awards. A total of 19 awards were given out in honor of regional and international stars. 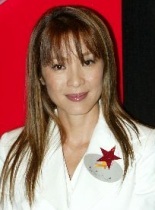 Michelle's close friend, late singer Anita Mui, was honored "Inspiration Award" and Michelle was invited to present the award. On the ceremony, Michelle paid a touching tribute to Anita. "To live, she performed, to perform, she lived," Michelle concluded Anita's life. "We're very fortunate that she touched the world in so many ways," said Michelle. "Her legacy will live on with us." Michelle received the trophy on Anita's behalf. - Michelle is attending The MTV Asia Awards 2004 in Singapore, February 14. - Several people asked me where they could get Silver Hawk DVD. As far as I know, the DVD of Mandarin dubbed version of Silver Hawk is distributed in Mainland China ONLY. It has only Mandarin soundtrack and simplified Chinese subtitles, and it's Region 6. I don't know when the official DVD will be released in Hong Kong and other regions. Sorry. The right picture is the greetings Michelle wrote to readers of Chinese "Xinmin Evening News" and it was published on the newspaper. - In Silver Hawk: my report on Silver Hawk and a letter from producer Thomas Chung. - [Notice] There will be no update on this website before February 2nd. I'm heading to Beijing. More Silver Hawk! :-) An (early) Happy Chinese New Year to everyone. - Silver Hawk premiered in Beijing on January 13th and in Shanghai on 14th. In Silver Hawk: report and more photos from Beijing and Shanghai press conferences. Video link. And - the message board of the Silver Hawk Official Site is up! - On Jan. 13 9:00PM, Michelle, Richie Jen, Jingle Ma, Li Bingbing, and Brandon Chang showed up at Beijing Youth's Ynet "Red Star" online chatroom. Here is a link to the chat transcript (in Simplified Chinese). 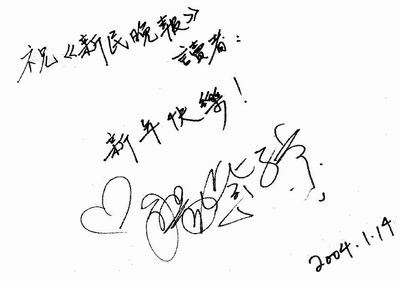 - Not long ago, Anita Mui launched a Chinese book, Heart Of The Modern Woman, to raise funds for the Children's Cancer Foundation. It contains her interviews with more than a dozen of her celebrity pals including Michelle. Here I've translated the Michelle interview by Anita in the book. It's actually not like an interview, instead it's more of a chat between two extrordinary women and sister-like friends. It is a tribute to the character of both the women featured in it. Thanks Kityi for the article scans and Yvonne for the text editing. 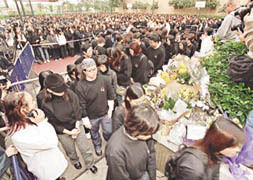 - On Sunday January 11th, 7,000 to 10,000 people attended the public memorial for Anita Mui. Anita's funeral committee posted a newspaper obituary captioned: "Goodbye, Hong Kong's Daughter!" 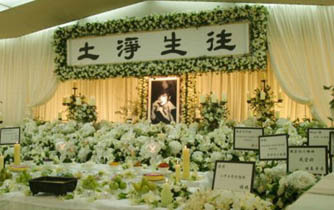 The final funeral ceremony and cremation will be on Monday. Michelle will be one of the eight people to carry the casket for Anita. 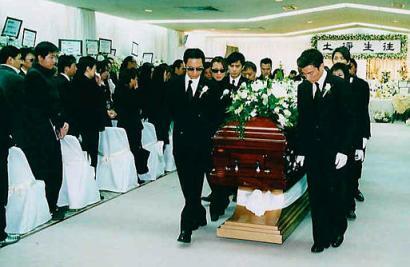 By Hong Kong tradition no female is allowed to carry the casket. It is highly unusual on tomorrow's funeral there will be two female members, Michelle and Cheung Man-yee, the former director of Broadcasting in Hong Kong, among the eight. 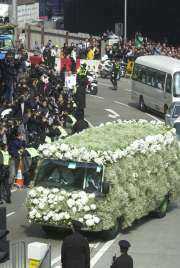 The other pallbearers will be actor Andy Lau, Anita's designer Eddie Lau, singer David Tao, actor Tony Leung Chiu Wai, Anita's insurance executive friend Lin Yin Fai and film producer So Hau Leung. - My very brief report on Silver Hawk. - In Silver Hawk: a story and some photos on Michelle's motorbike jump. - New photos and article scans added for BAZAAR magazine. Thanks Sheryn! - On January 5th, Michelle, together with director John Woo and actress Yu So-Chow (a.k.a Yu Suqiu), attended the Hand Imprint Ceremony for the Avenue of Stars, the Hong Kong version of Walk of Fame, which honours selected Hong Kong film professionals through a display of their hand imprints and signatures. The avenue will open at the second quarter of this year and will originally feature over 70 handprints from stars picked by Hong Kong Film Awards Association. It is expected to become a new Hong Kong tourist attraction. 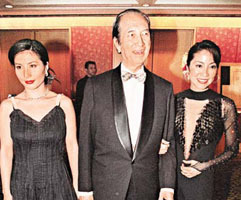 Anita Mui was supposed to be one of the stars as well on the avenue. She had in fact accepted the invitation. When Anita's name was mentioned, Michelle lowered her head and quickly put her sun glasses on. Still, she was wiping her tears and even had to leave the stage for a short time... Michelle did not attend the media interview session afterwards. - Malaysian fans - your chance of meeting Silver Hawk! - Silver Hawk updates: tentative premiere dates, film song information, and new videos on the official site.